Blog: What is Dr. Bones? I think it is about time that I properly introduced Dr. Bones, and tell you a little about the game and what you will get up to on your adventure. This is also the first in a series of development blog posts where I will post updates, music and artwork from the game as it progresses, and maybe even something playable later on! Dr. Bones is an explorer, seasoned from years in dangerous temples and jungles. He is also, notably, a dog. A pug to be precise. 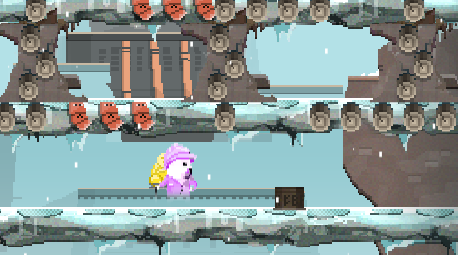 This gentlepug is the main character of the game, and is who you will be controlling. The game revolves around exploring exciting locations such as Tibetan temples, Egyptian burial crypts and much more, each with their own deadly traps and obstacles, and each with their own treasures to collect and coins to grab! The treasures and coins will let you purchase new items and equipment to help you get further in the temples, and get new maps for different locations. Upon descending into a temple using your balloon, and taking the first treasure that you can find, all hell breaks loose and the temple starts to collapse into the ground, as was the traditional security measure at the time. Climb up through the temple before you get crushed, collecting as many different treasures and coins as you can and stuffing them into your bag to take home with you. 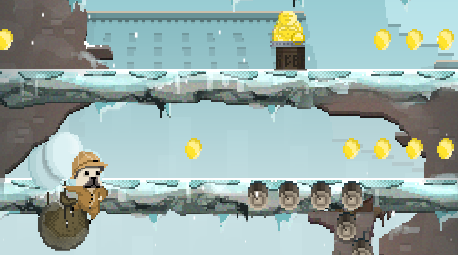 The levels are randomly generated, so you will never travel through the exact same temple twice! Some of the treasures are cursed, and picking them up can have some crazy effects upon you. There aren't too many just yet, but so far include reversing your controls, flipping the screen upside down and turning you into a ghost! The curses last for a random amount of time, and you cannot put a treasure into your sack until the curse has worn off. There is still a lot of work to do on the game, so expect regular updates showing the new content that is being added, and please do leave feedback on what you have seen so far, and what you would like to see!